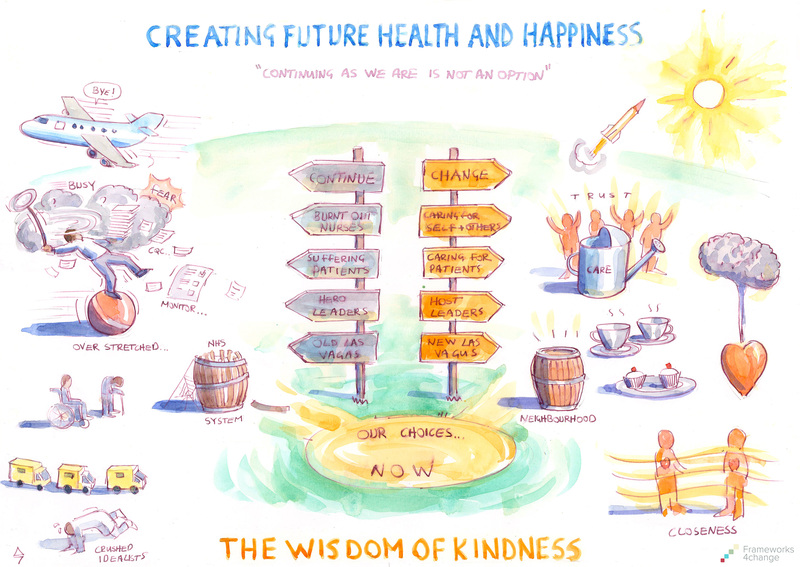 Our Future Health & Happiness – a PAINTING by Julian Burton! This fabulous painting was created for us by the talented Julian Burton from Delta 7. Delta7 is a change consultancy specialising in board alignment, employee engagement and behaviour change using unique Visual Dialogue methodology. To find out more please click here to view Delta 7’s website. A massive Thank-you to Julian for this amazing image from all of us at Frameworks 4 Change. You may be looking after others on the front line of health care – with all of the daily challenges that brings. Or you may be managing a team tasked with a seemingly impossible combination of targets. Or leading an organisation that is trying to hold to a vision of humane care within a seemingly impossible system. Or even trying to reform the system via research, campaigns or politics. Whichever applies, you are leading – trying to make a difference, acting beyond self to change things, big or small. If so, you are likely to face complexity, overload and great calls on your personal resilience. Practice gratitude: give time daily to feeling good about some things for which you can be thankful, however small. Think beyond: this has a range of meanings. Think beyond self: who and what are you serving? Think beyond now: what do you want to be remembered for? Think beyond your usual mindset: in what ways might your thinking and assumptions be stuck? Connect with purpose: what is your purpose as an organisation or as a person? The key here is to make sure it is inspiring – something that you really feel good about. How well is this purpose shared with those around you, and how can you stay connected to it? Being generous by acting from a positive purpose always benefits you – it hits you first on the way out. Join with others: find companions and support. Don’t be lonely with your problems. Build three support teams: your personal support team, your task support team, and your influence support team. Few good things are achieved alone. Learn how to have powerful conversations. Listen well, don’t interrupt, ask questions that matter. And manage the dark side: stick up for what matters to you, don’t tolerate unkindness, find your courage by going towards the things you fear, in small ways at first. Act as One: at a personal level, what does your authentic self-call you to do? What does integrity mean to you? It may not be easy, but it will reward you hugely over time. Similarly in a team or organisation, how could you pull together better? Adopt an I+U+ mindset: I’m alright, you’re alright. Whenever possible, assume that the other person is trying their best. Become aware of when you slip into the other three variations: I+U-, I-U+ and I-U-. Often we have deep habits around these that can be hard to break – with particular people or in certain situations. Get exercise: look after your first home, your body. Find something you love: from yoga to running, dance to pottery! Try the 5:2 diet; sign up for an event that gives you a goal; find a group that can make it fun and regular, a reward. Use this as time to switch off the “monkey mind” – that busy anxious brain; a mindfulness practice can also be great. Serve the planet – your bigger home needs you. Buy green energy, join a wildlife group, do your recycling. Stand in awe at a sunset, birdsong or a butterfly. Nature is all around us if we choose to look, but is in trouble because many of us feel separate, above. Create an ERA culture: Encouragement, Recognition and Appreciation. This is simple but so often overlooked: “Thank you for looking after Mrs Smith so nicely”; “Great report, thanks”, or “Why don’t you give it a try”. Perhaps above all else, try to establish a conversation with yourself that is kind, gentle and forgiving; we can be our own harshest critics, and our “inner voice” rarely switches off. Notice your own self talk and try to practice ERA on yourself. You don’t have to do all of this. But the more stress and complexity you face, the more you are likely to find these practices essential to maintain balance, calm and confidence in your life. Good luck and let us know how you get on! Written by Dr Alister Scott and Neil Scotton who are co-founders of The One Leadership Project, which they created to support the people in organisations who are leading big change, playing their part in addressing the most complex challenges, and shifting systems for the better. Given the ever increasing profile of our NHS, the associated challenges and many opinions as to what should happen to it and how it should look, it is safe to say that the historic picture and frame we have of our health service is likely to change, infact change will be the only constant and guarantee. Like all change this usually presents challenges many of which will be out of our control as individuals as we ourselves undergo a psychological shift of letting go of what was and begin working towards what the new normal looks like. When initially thinking about letting go of what I currently recognise as the infrastructure of our NHS and consider the concept of moving towards a Neighbourhood Health Service it immediately led to thinking of my part in it. Why? – I think this is because I automatically relate to being part of a neighbourhood and within that a will to do the right thing where possible within my community. The idea of neighbourhood’s mobilising in coming together through a joint vision or value base is not new, if you take for example The Neighbourhood Watch Association who state their vision as being that of a caring society focused on trust and respect in which people are safe from crime and enjoy a good quality of life. Neighbourhood Watch is about making sure that no one has to feel afraid, vulnerable or isolated in the place where they live. It’s about people looking out for each other, crossing barriers of age, race and class to create real communities that benefit everyone. I think there are definite elements of this vision that could translate to a Neighbourhood Health Service, not least the ‘looking out for each other’ aspect. I would add to this the importance of looking out for ourselves as ultimately it could be argued that the first point of patient care is self-care in recognising our responsibility for keeping our selves well and able to function at an optimum level for the patients we serve. The challenges the NHS face are huge and often overwhelming when beginning to think as an individual about how we can make a difference however, change can start with us as individuals and ‘looking out for each other’ is something that is within our gift. There are simple acts of kindness that we as individuals have control over that can contribute to an ethos as described in the vision above. Whilst some may view this thinking as twee, there is evidence to suggest that being kind and giving back can contribute significantly to personal resilience which is intrinsically linked to organisational resilience, both of which I believe would support a Neighbourhood Health Service. The five a day for wellbeing developed by New Economics maps nicely with this view and describes how being kind and ‘doing the right thing’ can increase our own happiness emotional health. They encourage us to actively become engaged in the conscious practice of giving through doing something nice for a friend, or a stranger, thanking someone, smiling, volunteering our time, joining a community group, looking out as well as in, seeing ourselves and our happiness, as linked to the wider community as this can be incredibly rewarding and creates connections with the people around you – surely all of which would be supportive of a neighbourhood approach. I believe the above is something we all have a chance to do when thinking about the ‘new’ normal of our health service; we all have choices to make around our attitude in shaping, being a part of and modeling change through becoming active members of a community. We also have the word ‘kinship’ deriving from the same root, and kinship implies a social connection and belonging, a sense of people being valued and respected. During my childhood and adolescence, I had several operations and anxious hospital visits. Some were upsetting, but a few were not. The ones that were not all shared a commonality: a doctor or nurse treated me with kindness. It only took a moment, just a reassurance, asking me how I was doing. They told me clearly what my diagnosis was, what they were going to do, how much they knew and didn’t know, and what I needed to do afterwards to recover well. This represents exemplary and fundamental professional practice, yet on the occasions when I didn’t receive this ‘kindness’, I found the experience of surgery upsetting and even traumatising. Quite simply, when I was treated with dignity and respect, I felt calm, safe and cared for – and I recovered well. In John Ballatt’s book, ‘Intelligent Kindness: Reforming the Culture of Healthcare’ (2), a series of interviews with patients about ‘ what do they really want from our doctors the testimonies arrived at these conclusions: patients wanted doctors to be kind, offer hope and certainty, provides relief from suffering, and to be available at short notice. Notice that patients didn’t ask the doctor to lie about their condition. They wanted ‘hope and certainty.’ The quality of kindness does not require additional time; it simply requires an awareness that the relationship between human beings is paramount. Our Future Health is about making this kindness and kinship thrive in our daily lives. We need it when we are critically ill for sure, but more importantly our wellbeing comes from the connections and belonging we create with each other. And it costs nothing extra and demands no more time either. remember. During the last 11 days of her life, I dropped everything I was doing to be with her. many we had on her good days between each health crisis. friends, watch a movie, enjoy a good meal, play with her dog, chat long hours on the phone. the registration, the nurse wheeled her in to her ward. medicine. Yes, mum and I do talk about death, but mostly we talk about life and living. You can watch my digital story tribute to her here. I stand in tree pose, Vrksasana, balancing uncertainly at first: right leg rooting my foot to the ground, left foot pressed into my right thigh, hands reaching to the sky, body swaying as the prairie wind sweeps through my backyard. I wobble and panic, my throat contracts, my abdomen clutches, my toes stretch apart, claw the earth; my mind notices these things, reminds me to breathe. I inhale and exhale and continue to sway. I hear birds chirping in the hedge, traffic rushing on the distant freeway, my dog rustling through the grass. The sun warms my face; I shine. Or perhaps I stumble and start again. In yoga the swaying and stumbling are important. We call it “playing the edge” —acknowledging whatever might be challenging your stability: a strong wind, an anxious thought, a tired muscle, an unfamiliar experience—and maintaining your pose as well as you can, observing your body and mind’s responses with interest but without judgment. So much of what we can learn from yoga arises from that willingness to place ourselves (not just our bodies) in positions that can bring both tension and liberation. In some ways each pose, each asana, is a little memoir, a pantomime about our relationship to the world, our manner of living. To a passerby Tadasana, mountain pose, is imperceptible from simply standing erect. What makes this pose yoga is intentionality. The yogi positions her feet carefully, noting the placement of bone over bone: tibia above ankle, femur above patella, up through skull upon neck above spine. She brings awareness to her stability, her gaze, her breath. Some muscles are held tight, others released. She attunes the stance to the intention of that day’s practice, which itself may have a specific theme or narrative structure with each pose chosen as an opportunity to embody strength, or radiance, or connectedness to the earth. As we ponder our future health and happiness, yoga’s gift is the practice of deep awareness to our ever-changing bodies and ever-changing lives. We accept where we are at each moment, then play with what is possible, understanding that even in discomfort we are perfect just as we are. Are health and happiness linked? More and more appears to be expected from our health services as medicine makes vast progress. Are we in danger of equating health and happiness to mean the ideal? Happiness can be found in the most tiny things; the smile of the carer as they attend to your personal needs. The touch of a friend as they visit. The act of giving and seeing the pleasure received, none of these depend on being healthy. To be healthy is a wonderful bonus in life. A bonus we take for granted for so long until reaching the age when the body starts its decline and wears out. The older we get the more we seem to expect from the NHS but it appears the services once offered especially community based ones, are in decline. The community midwife, the district nurse, the mental health nurse, of thirty years ago offered the link between the person requiring help and the help available to them. With this link being eroded it appears the individual is required to source their own information more and more. We depend on others offering reassurance and giving to us their knowledge and expertise. Do we expect more than any organization, be it the NHS or the not for profit organisations that have emerged. Can we choose the level of our own dependency? Or is resting solely on the statuary bodies I have the ability still (just!) to reach out for help when needed but I am aware many many of my generation are not able do to this. How many sit in their homes in ill health and unhappiness? Isolated behind doors that were once opened by the community staff regularly visiting. Fractured families must mean more and more people will find themselves isolated from help and each other. I have been fortunate in being able to reach and receive help when I needed it. Will this level of care be available to all in the future? It is not just about money – it is about the will of all people to push for the future health and happiness of our young, elderly and unwell.